VoIP is rapidly becoming the standard for voice communications in business, government, education, government and healthcare. It offers capabilities that far exceed traditional phone systems, with unified communication platforms promising to integrate messaging, mobility, collaboration, relationship management, teleconferencing and other advanced features. 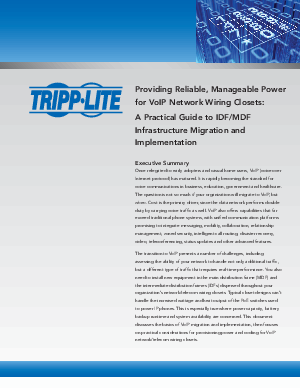 The transition to VoIP presents a number of challenges like the need to install new equipment in the MDF and the IDFs dispersed throughout your organization's network/telecom wiring closets. Typical closet designs can't handle the increased wattage and heat output of the PoE switches used to power IP phones.